Posted on April 26, 2018 , in Hot Tubs. One of the main uses for hot tubs is the benefits they can provide to hard-working athletes. Many of which incorporate them into their muscle recovery routine. With the warm water, many find that it perfectly helps those sore, tired, and strained muscles. So much so that athletes have been known to go for a soak before and after a workout. In this article, we discuss how athletes can benefit from hot tub therapy and treat many common conditions they face. As the weather starts to change, more and more people are taking to the baseball fields. This fun sport is great for the cardiovascular system but does come with some common injuries that may need a bit of care. For example, torn ligaments and knee injuries are both very common. Some others include muscle strains, sprains, and rotator cuff tears. When you take the time to have a soak you will be boosting blood circulation which can help heal and repair damaged muscle tissue quickly. Those that run know how great of a cardiovascular exercise it can be. Once you get started, it can quickly become very addicting leading to multiple runs a week and even marathons. Some runners have found that taking the time to have a hot tub soak has helped bring balance to their workout routines. It can ease muscle tension and help relieve runners knee. This healing process also decreases the pressure applied to joints while increasing mobility. Hot tubs are great for runners all around. It may seem odd that swimmers can benefit from hot tubs, but there are still many injuries swimmers can experience and, therefore, can benefit from a hot tub. Two common upper body injuries include shoulder inflammation and bicep tendon pain. For the lower body, swimmers may experience hip and tendon inflammation, as well as back pain. Hot tubs will help provide therapeutic relief to soothe muscles. Ultimately helping reduce the amount of recovery time. Lastly, taking a soak before a workout or big game can help an athlete relax and put their focus where it needs to be. 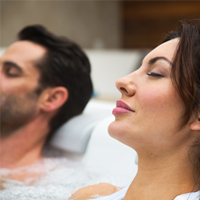 For those of you that are not personally involved in sports or enjoy more leisurely activities like going for a walk or yoga, should know a hot tub can help. No matter your activity, hot tubs can allow you to feel weightless, giving your joints a beak and your muscles some TLC. As you can see, many sports benefit from hot tub therapy!If you are interested in learning more about hot tub massage benefits download our hot tub buyer’s guide here.